India is investing billions in arms. But without a coherent organizational structure, it will never become an effective war fighting machine. India is an aspiring super power, and one of the largest arms importers in the world. But this month, following the defense procurement corruption exposé by Army Chief Gen. V.K. Singhand the hullabaloo over supposed troop movements near Delhi, it seems that India isn’t ready either to effectively absorb the battle-ready equipment being imported, or even command it properly. At the center of the debate has been a heated discussion over whether India should have a unified command system under which the chiefs of the Army, Navy and Air Force, could operate coherently and to mutual benefit. But the debate should be even louder than it is now. 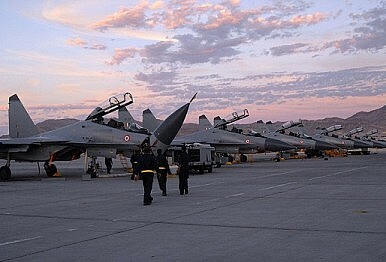 Our strategic and super power ambitions are manifest in all three armed forces: the Air Force, which is in the process of one of the largest arms deals ever in the acquisition of the Medium Multi-Role Combat Aircraft (MMRCA); the Navywhich has developed so-called blue water capabilities far beyond coastal defense; and the Army, which is raising two strike corps capable of offensive operations into Tibet and for possible use against China. Yet we still don’t have the necessary organizational structure to wield such massive fire power as a coherent force, one that can either repel external aggressors or project India’s power overseas. The reasons are many, but the most problematic one is the archaic World War II defense institutions around which our armed forces are organized. They were adapted from the needs of a colonial power, whose main concern was the subjugation of the indigenous population, and not designed to repel external aggressors. There has been little or no change since then. Post-Kargil conflict in 1999 to 2000, the Kargil Review committee headed by noted strategist R.K. Subrahmanyam also recommended a unified command. This organization needs to be restructured and updated, and the quickest way to start is to have a Joint Chiefs of Defense Staff to co-ordinate and synergize operations and equipment. In war, the application of maximum combat power at decisive periods influences the outcome of battle. Maximum combat power, however, isn’t simply the sum of the forces used – it’s the product of synergies generated by using arms and services coherently. Today, the three services are autonomous, and any synergy that does exist is pure chance. Examples are the lack of, or minimal use of, the Air Force in 1962 against the Chinese and in 1999 during the Kargil incursion by Pakistan. In both instances, the Indian Air Force resisted the use of air power on various grounds, hurting India’s war effort. In 1962, air power wasn’t used at all, while in 1999, the Air Force came in many days too late, perhaps on the orders of the civilian government in New Delhi. India doesn’t follow an integrated command system during peace or in times of combat, so each armed force prosecutes war as they see appropriate (and possibly in a manner where they get the most glory). There have been very few instances when the combat power of one force was deployed under a commander of another (the Andaman Command is a notable exception).